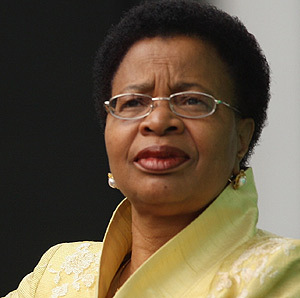 October 17, 1945 Graca Simbine Machel, educator and international advocate for women’s and children’s rights, was born in Incadine, Mozambique. In 1968, Machel earned a scholarship to the University of Lisbon in Portugal where she first became involved in independence issues. She returned to Mozambique in 1973 and following the country’s independence in 1975 was appointed Minister of Education and Culture, a position she held until 1986. In 1995, Machel was awarded the Nansen Medal from the United Nations in recognition of her longstanding humanitarian work on behalf of refugee children. In 1996, she chaired the committee that produced the United Nations Report on the Impact of Armed Conflict on Children. Machel is fluent in English, Spanish, Italian, French, Portuguese, and her native Tsonga. She is the only person in the world to have been married to the presidents of two different nations, widow of Samora Machel, former President of Mozambique, and current wife of Nelson Mandela, former President of South Africa. Machel currently serves as the chair of the Association of European Parliamentarians with Africa executive committee.